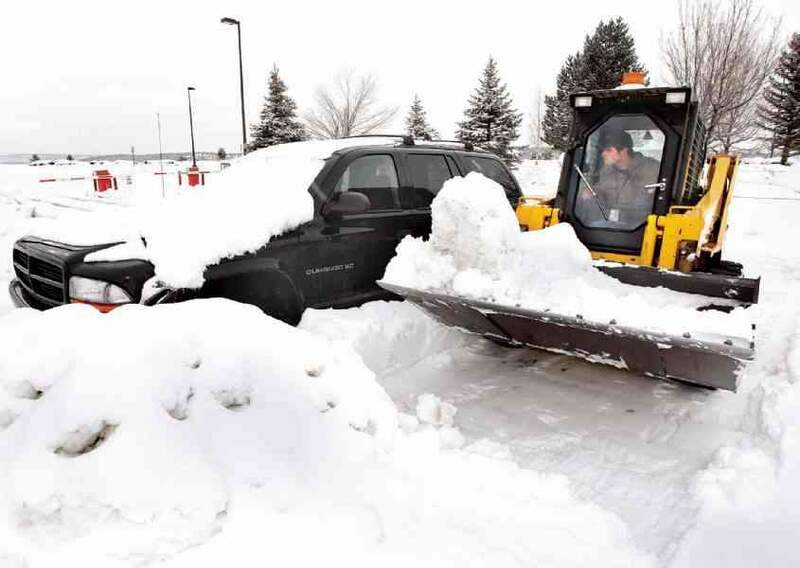 Benjamin Shisler, a temporary employee with the city of Durango, operates a skid loader Monday as he removes snow in the short-term parking area at the Durango-La Plata County Airport. 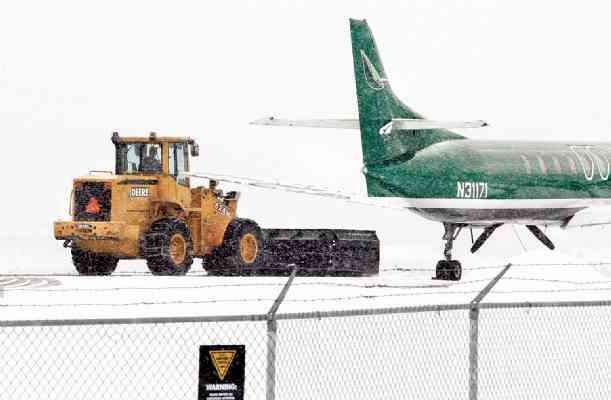 A snowplow clears snow Monday from the taxiway and runways. The weather is wreaking havoc with activities at Durango-La Plata County Airport, canceling or delaying flights, complicating snow removal and trying the patience of travelers looking for a space to park.Two early United Express flights from Durango to Denver were delayed Monday morning, and a United Express flight scheduled to arrive in Durango from Denver later in the morning was canceled because of an icy runway, said Aviation Director Ron Dent. "We got off to a slow start this morning because the runway was a sheet of ice," Dent said about midafternoon Monday. "But everything is back to normal now." The 6:06 a.m. and 8:01 a.m. departures of United Express from Durango were delayed four hours and two hours, respectively, Dent said. The United Express flight scheduled to arrive in Durango from Denver at 11:39 a.m. was canceled. Snowplows were clearing airport parking lots as best they could Monday afternoon. The plows had to operate in whatever open space they found among parked vehicles. "Christmas Day and the two days following, all parking lots were full," Dent said. "Some people parked where they shouldn't have, which filled the lots beyond capacity. We had to remove some vehicles, including one that was simply dumped at the entrance to the parking lot." Dent didn't know if the person who left the vehicle at the parking lot entrance was flying out or was there to meet someone. "Our parking isn't like City Market, where the lot clears out at night so it can be plowed and be ready for the next day," Dent said. "We often have to clear one space at a time." The airport has about 700 parking spots, including spaces in the lot offering credit-card access. A new parking lot with 250 spaces is planned for this year. "It's frustrating because it's been snowing lightly but steadily, and cold temperatures haven't helped," Dent said. "We're hoping for some warmer days."